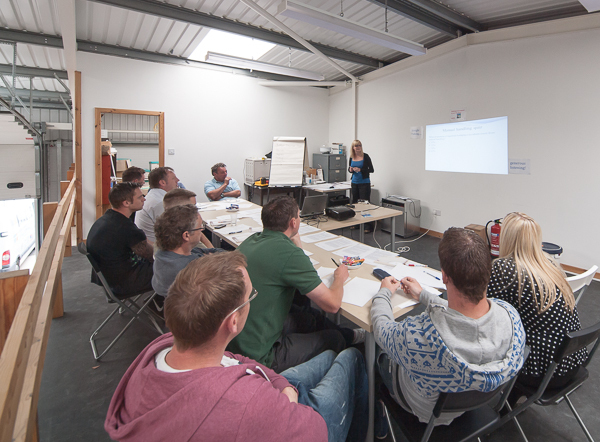 Katrina Jackson delivers her first presentation as a qualified manual handling trainer – with great success! Monday the 24th June was a just such a day and together, we planned a full day of learning activities, which we’d prepared for, for months. I have become concerned about the mayor safety risk which in our case is working at height. However, in construction the most common types of injury are simple sprains, back injuries, pulled muscles and such, so manual handling is also a worry. My guys are lifting, pushing, pulling and twisting all day long, Even the office staff are at risk, as they work. Long term health problems are developed over time, like lung problems, hearing loss and vibration white finger can sneak up on employees and once the harm is done, there’s no going back. Can someone become ill, or suffer disabling injury as they go about their daily work? Yes – a slipped disc or eye injury is very serious. Could my staff become ill later in life, perhaps after they’ve retired or are in their middle age, due to something we’ve been doing at work? Yes; do their dust masks fit? Are they putting them on right; wearing their ear protection and being sensible about vibration? So the day included sessions to address all of the above. Several weeks ago our administration manager, Katrina Jackson attended a two day City & Guild approved ‘Train the Trainer’ course in manual handling. This was designed to get in house competent knowledge, which could be tailored to fit the needs of our team. Katrina delivered a manual handling session to the staff, which included in depth information on anatomy, so that they could better understand how injuries happen. Everyone’s attention was on Kat as she showed slides and diagrams of the spine and explained how a simple incorrect lifting method, can amplify the weight of a load, putting massive strain on the spine and muscles. A fire extinguisher, some boxes with varying size and weight, and a tub or Storm Dry water repellent cream were used, to demonstrate lifting methods. There were laughs aplenty as Kat invited each of us, to lift the various items and the careless methods we used showed just how important it is, to go over this stuff again and again; we just get sloppy otherwise, and it only takes a moment of inattention to end up with a strain or worse. 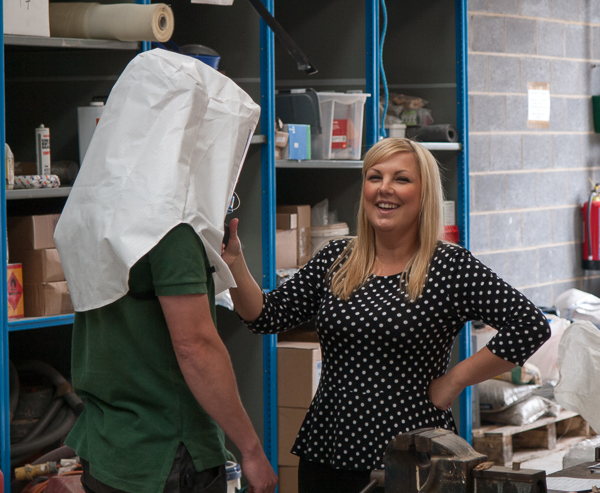 The technicians all have a go at lifting safely – with much merriment. The facts and figures about the time back injuries can mean off work and the awful impact they can have on a family brought home the gravity of the problem and Kat did a great job. Administrator, Sian Caley had also been working hard in advance, to prepare for today. Sian attended a full day training course under the http://www.fit2fit.org/ mask face fit training scheme. 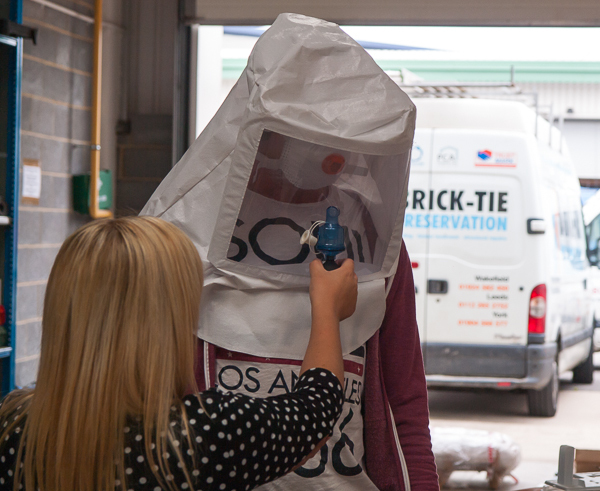 This scheme is a HSE approved method of training staff to a standard where they can carry out mask face fit testing and satisfy the requirements of the Personal Protective Equipment Regulations (PPER), 1992, which state, amongst other things, that the PPE must fit the wearer, be selected by a competent person and training in it’s use should be given; why it is used and how it is used. Sian carried out the qualitative testing throughout the day using a test kit which includes the atomisers, bitrex solution and a hood. We talked about silicosis and other types of lung disease. We selected new higher quality masks and the opinion of the technicians after, was that these are the most comfortable and best fitting they’ve used to date. ‘Can you taste anything yet’? I prepared seven presentations, based on expanded toolbox talks. These were presented in PowerPoint, with a selection of gruesome (real), images found on Google images. Employees legal liabilities – I opened with this to ensure that all the team were reminded that health and safety and protection of employees is everyone’s responsibility. The basic law was covered, along with some of the regulations enabled by the Health and Safety at work etc Act 1974, including COSHH. Some of the lad sat up when they were told that they can be sent to prison for up to six months or fined £5000 for each offence of sections 7 + 8 of the Act, and that this also applies to regulations enabled under it. Noise at work – the damage it can do; the irreversibility of noise induced hearing loss; sources of noise; noise mitigation and avoidance; use of ear defenders and ear protectors; correct selection and fitting of PPE. Eye Protection – examples of eye injuries (very gruesome), types of injury; hazards, including impact, dust; burns and chemical damage. Avoidance, elimination and control was covered and then of course PPE, types and use. Skin Protection – dermatitis, skin cancer, warts, oil acne and general skin irritation and skin sensitisation were covered. The substances most likely to cause problems were outlined, specific to our activity, along with an explanation of the mechanics of harm – acids, alkalis and Chromates. Avoidance, substitution and dilution plus PPE were included here. Ladder Safety – When these can and can’t be used, correct inspection and use on site. Despite our team trying hard to stay safe we all agreed that ladder use must be an access method of last resort and only for temporary work. Tower Scaffold – examples trawled from the internet showed collapsed towers with the details of fines and injuries sustained. All out staff are PASMA certified, but even so, a good session was had, going over the pre erection inspection routine; erection methods’ hazards on site and regulations on use of toe-boards; hand-rails and our-riggers. Vibration controls and hazards was covered by technician Craig Tarbotton. Last year Craig agreed to sit his IOSH ‘Managing safely’ course and passed with flying colours. He is my health and safety eyes and ears on site and agreed at short notice to give the presentation. Craig did really well and despite some ‘joshing’, maintained our interest and we had a good discussion on the damage vibration can cause; sources of vibration in our daily work; managing the problem; monitoring the issue and reducing exposure. Julie Hindle was holding the fort in the office and also made-up a great buffet lunch for us all and kept the Brick-Tie wagon on course too. A nice surprise was a visit during the day from David Lambert and Robert Deary, who are our principle suppliers of damp proofing and waterproofing materials and systems (Safeguard Europe). They both sat through the Vibration and Skin Protection presentation and David chipped in, having good knowledge of chemical threats to health, via his decades in the business. 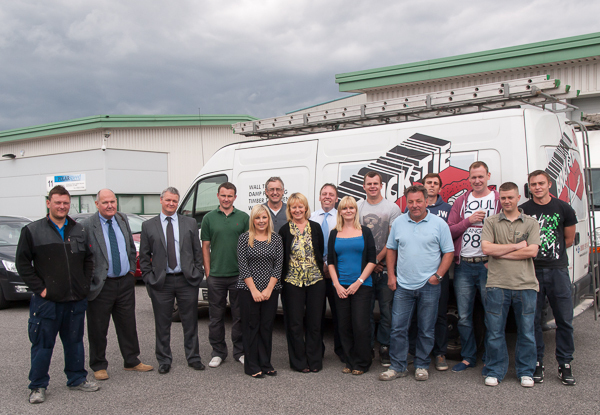 David Lambert and Robert Deary (second and third from the left), join the Brick Tie Team on our June training day. Our final sessions departed from safety and looked at our wall tie tension testing methods. The team dissected and reviewed our testing procedures and we came up with a coupe of improvements, which will be incorporated to ensure that the testing of our remedial wall tie installations meets all requirements. Communication with clients throughout their journey with us was also on the agenda and once more, ideas came mainly from the installation technicians – outstanding. We ended the day with broad grins and it was so nice to spend a full day together, without pressure. I cannot do justice to the team enough – the open support they give each other and me is breathtaking and I am so lucky to be surrounded by such people. Health and Safety is a bit daunting at first but it needn’t be, if you can just get enough basic training to remove the fear – it soon gets replaced with enthusiasm. I’d recommend the NEBOSH general certificate in occupational safety and health as a good grounding to help managers and owners get to grips. In saying that – I am not in favour of anyone in my position getting beyond themselves and so I retain my safety consultants, Stalllard Kane, who are far more competent than I’ll ever have the time to be. Special thanks also to Nigel Deane of ND Safety, who gave me the inspiration to start getting Health and Safety embeded in my company’s culture and helped me through my NEBOSH general certificate; I can recommend Nigel to any other northerners who need health and safety training. PS – I will be placing my presentations from the day on drop-box for any PCA member to download, provided they use them as a guide only and as a work in progress – anyone who relies on these must do so under your own responsibility – I am no expert in Health and Safety… these are just a nudge in the right direction. ABSOLUTELY impressed AS EVER ! You are all WONDERFUL . . . . . whilst you were all being H&S trained I was being wined and dined for my birthday . . . However, I want to run a similar day for my guys and any info I can grab from you in regards to my rpeparation would be FANTASTIC . . . . SPeak soon ., . . . .
You always support our efforts Annabelle and this is much appreciated. First get the day booked in and see if you have a chance to do the four day IOSH, which could help get you in the right frame of mind – or send Dean on it. Then maybe look at asking the lads well in advance about their concerns too. Also maybe show them our day on this post and ask – if we did this, what would you like to add – and can you help?